Your heart is probably the most important organ in your body. Five quarts of blood flows through it every minute. By the end of a day, your heart has pumped almost 2,000 gallons of blood and your heart muscle will have beat 100,000 times. Your heart is an astonishingly efficient and tireless worker. Without a doubt, your heart is the hardest-working muscle in your body. The heart is made up of four chambers. Each chamber has a valve that lets blood in and out. The two upper chambers of your heart let blood in, while the two lower chambers pump blood out. Now what about the system of blood vessels that carry blood to the rest of your body? Blood vessels take blood to every part of your body, carrying life-giving oxygen and nutrients to cells. These same blood vessels pick up waste products like carbon dioxide and carry them away. There are three basic types of blood vessels: veins, arteries, and capillaries. It’s the job of your arteries to carry oxygenated and nutrient-rich blood away from your heart. There are two main arteries that flow from the heart. The pulmonary artery is located on the right side of your heart and travels to the lungs where the blood picks up fresh oxygen. Your aorta is on the left side of your heart and it carries oxygen-rich blood to the rest of your body. Your coronary arteries carry blood to your heart which must have its own supply to continue to function. So you can see how important these three arteries are. These arteries need to be kept healthy and free of any blockages. Coronary artery disease happens when the arteries become clogged with plaque. Plaque can build up as the result of fatty deposits and cholesterol. Because the blocked arteries now have a narrow path through which blood can flow, the heart receives less oxygen. Chest pains can be the result that can then turn into angina. Clearly, you want to keep your coronary arteries clear of plaque. Your heart has so much work to do every day that it needs all the oxygen the coronary arteries can carry to it. You can keep your arteries clear by watching your cholesterol levels and following a healthy lifestyle. One of the best ways to keep cholesterol levels in check is to pay attention to the foods you eat. Here is one food that can help keep a healthy amount of blood flowing through your arteries: dark chocolate. Yes, that’s right! In a recent clinical trial, researchers investigated the benefits of dark chocolate consumption in overweight men. The researchers found, after four weeks of chocolate intake, that blood flow in the arteries increased. 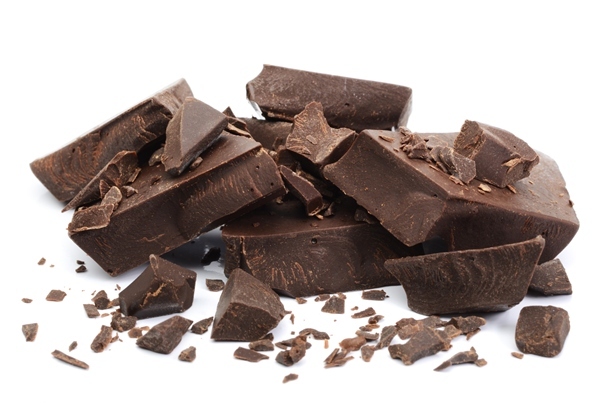 The dark chocolate also reduced markers for inflammation. If you haven’t added dark chocolate to your diet yet, maybe now is the time to give some a try. If you’ve been used to eating milk chocolate, it may take some time to get accustomed to the slightly bitter taste of dark chocolate. Try chocolate that’s 50% dark. Once you’re okay with that taste, you can keep increasing the percentage, all the way up to 80% dark. The darker the chocolate you eat, the more antioxidants you’ll get. Faseb, J., et al., “Dark chocolate consumption improves leukocyte adhesion factors and vascular function in overweight men,” Dec 3, 2013. “Heart-health Benefits of Chocolate Unveiled,” The Cleveland Clinic web site; http://my.clevelandclinic.org/heart/prevention/nutrition/chocolate.aspx, last accessed Dec. 6, 2013.